Enchanted Ladybug Creations: With Deepest Sympathy - CR84FN59! For all the CR84FN Challenge details, please be sure to visit the CR84FN Blog. And Of course, please do go and check out the Beautiful creations the rest of the Super talented DT has put together for your inspiration...8-) l Sure hope you can join us! Beautiful use of color and shape to make a gorgeous design. This is a lovely card for your friend Shannon, it's sure to lift her spirits at this sad time. I love the beautifully layered label, and pretty hand made flower and beautiful brad, a very beautiful card. Your friend will really appreciate this beautiful card. The layout is lovely and I do like the layered sentiment. Just gorgeous! Sorry to hear you needed a sympathy card. It is lovely thougt. The colors are just so perfect together. Love the frame, the pretty flowers... the doily looks great in the background. Also love the DP. Such a beautiful Sympathy card Shannon! Love all the layers and the gorgeous blossom! Surely to bring comfort to your friend during these difficult times. How soft and lovely. Beautiful details. Very very pretty card! Love the layers, dies, and paper that you used! I'm sure this card will be appreciated and bring comfort in a time of need! Take care, hugs! 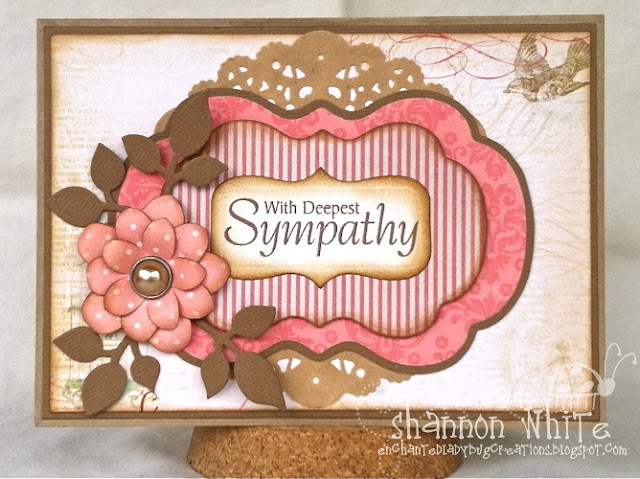 Beautiful sympathy card, Shannon! So lovely. Gorgeous card, Shannon! So sorry to hear about your friend's loss. This is one stunning card Shannon! I love the distressed sentiment panel and those pretty stems and flower! The bird in the corner is perfectly placed too. This is so lovely!! So lovely! Your combination of colors and the pretty flower! Pretty! Pretty! LOVE your combination of papers and the kraft doily. This is such a pretty card and sure to bring some comfort to your friend's family, Shannon. Very thoughtful of you. I'm sorry about your friends grandmother. I'm sure this beautiful card made them feel loved and comforted. This is such a gorgeous Sympathy card Shannon! 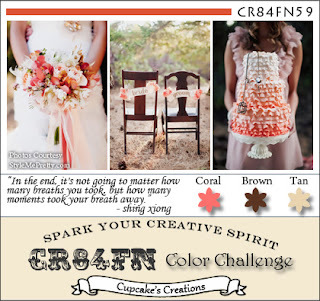 I love these colors together and your fabulous distressing!! Shannon this card is so beautiful! I'm sure your friend will be so touched to receive such a gorgeous card. Love all those layered nesties and the flower/leaves are fabulous!! Sorry to hear you had the need for a Sympathy card! Ohhh, how pretty! Beautiful layering of the papers with the dies and I love the polka dot flower. Such a sorry occasion for your card, but I know how it was appreciated, especially because you took the time to make it yourself. Such a pretty collection of elements Shannon, love the polka dot bloom!